Stewart Matsunaga was bottom fishing in 250 of water outside Ka'ena Point when he felt a strange weight on his rig. 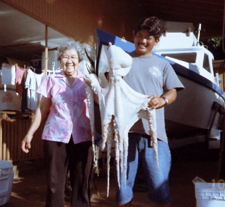 He kicked the Henry Ching bottom fishing reel into gear and raised the new state record octopus! It was an odd catch on bottom fishing gear, but Stewart wasn't complaining. At Tamura's Store where he weighed it in, he was told that the tako would sell for $94.86 retail!